I posted a little while ago about the LG Watch Phone. At the time it wasn't clear if the watch would really make it into production, but it has now been confirmed that the LG G910 watch phone will be available on the Orange network in the UK before the end of the year (no price or contract details are available yet). 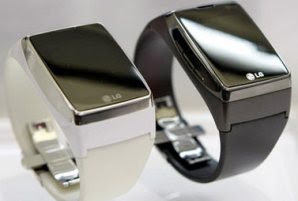 Unlike other watch-cellphones it won't require a Bluetooth headset, and will be equiped with a built-in speaker, microphone and 1.43 inch screen. The watch will also be internet-enabled. I now have the Inspector Gadget theme song in my head. Where can I buy it? It seems very elegant and sophisticated!